HOOK, LINE AND SINKER. At High Rock Cafe we have caught something BIG for you! We know your mouths have been watering at the idea of this announcement and we are pleased to announce the 4th Annual Carnivorous Tour, an “Off the Hook” edition! 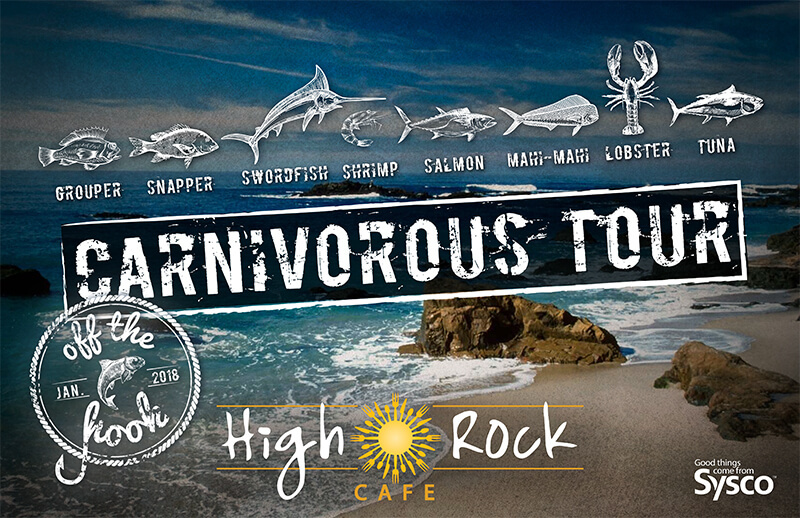 High Rock Cafe’s 4th Annual Carnivorous Tour will be underway come Wednesday, January 3rd, 2018, a time where we explore the oceanic world of fish, giving customers what they asked for with three different preparations of the fish each week over an 8-week period. The High Rock has a desire to educate our customers and expand their palette to different types of fish and seafood and flavors with which they might not be familiar. The High Rock kitchen staff is excited to explore the many different way to prepare these dishes where we will blacken, poach, ceviche, sauté, serve raw, you name it, in serving up some of the most creative dishes offered nowhere else in the Dells! Having already covered beef, pork, and poultry, our newest focus is surprisingly not fresh water fish that many Wisconsinites may be familiar with, but instead ocean saltwater fishes. Fish is known to be loaded with essential nutrients, such as protein and Vitamin D that are important for proper brain functionality. It’s also known to contain omega-3 fatty acids which are crucial fighting against depression literally raising your mood with each bite. Because we care about the body and brains of our customers we are excited to offer these oceanic fish for the overall health and palate satisfaction of everyone! Sustainable seafood is seafood that is either caught or farmed in ways that consider the long-term vitality of harvested species and the well being of the oceans, as well as the livelihoods of fish-dependent communities. When it comes to sustainability of the featured fish, think of a stop and go light. On our special menus we will provide graphics of each of the featured fish, where it is farmed, and the sustainability level to suffice curiosity about what you’ll be eating as well as to educate you before you stop in. Red signifies that the specific breed of fish in terms of sustainability have a depleting population. Yellow serves as a medium sustainability rate while green is encouragement enough to feast readily and often on that type of seafood. Sustainability is important to us at High Rock and how it affects the market. Our fish choices over the next 8 weeks are: Grouper, Snapper, Swordfish, Shrimp, Salmon, Mahi-Mahi, Lobster, and Tuna. A punch card will be available to all those who choose to take part in this culinary adventure and prizes will be awarded for continued participation. Every Wednesday the menu will change, so don’t forget to pick up your punch card and check out our website for the upcoming menu!